Filmy We November Glamego box Reviewed !! It’s Time To Review This Month’s November Glamego box Popularly Known as ” Filmy We ” !! ” Flimy We ” The name Itself Sounds Interesting . This Month’s box is Completely Based On The Bollywood Theme . This how the Box Looks From Outside .. When I Opened It , I found 4 Premium Products Inside this Beautiful box + Instructions Cards & Discount Vouchers..
TO BE DRAMATIC RETRO !! The Box itself is so beautiful & Cute Containing all products Useful.. This Is Cute Colourful Box With Cat print. But Before It’s Time To gain Some gyaan About The Brand. Many Of You are already Aware of These Subscription Boxes From Glamego. 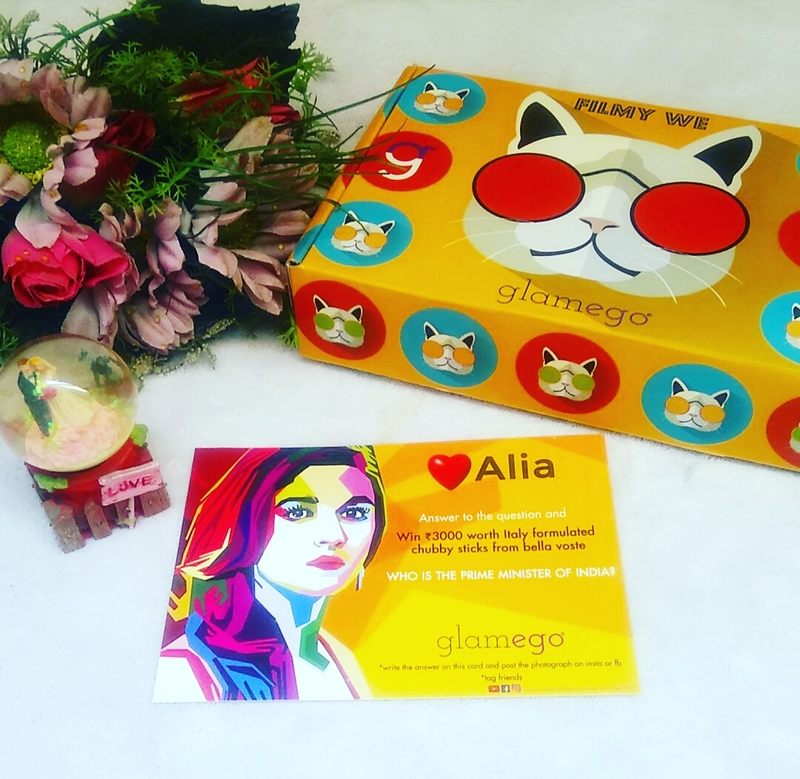 Glamego is India’s top online beauty subscription service. At GlamEgo, they believe in power of sampling that lets you experience and single-out a product of your choice before you spend on pricey products that you are clueless about. Through their GlamEgo box, thry offer their subscribers an unparalleled way of experiencing and exploring a wide range ofbeauty products from both established luxury brands as well as flourishing niche brands. Their beauty enthusiasts and in-house experts assemble a unique set of fascinating hand-picked products every month. As a subscriber, you will receive a monthly door-step delivery, of their GlamEgo box that is sure to dazzle and delight you. It’s India’s Most Affordable Subscription service which saves your money for sure. Why To Choose Glamego ?? 1) IT IS JUST 299/- per month with FREE SHIPPING which no company in India provides. 2) GlamEgo concentrates only on getting the Premium brands and their best products for exploration to subscribers. 3) GlamEgo gets the products only which are useful in day-to-day routine and which can be adaptable. Plus Chance to win 3000/- worth Bella Voste Chubby sticks Plus Discount vouchers From The Products Of the brand !! This Is an Moisturizing lipstick to protect our lips this winter. It Don’t dry out the lips even in harsh winds . This is a moisturizing ITALY FORMULATED. LIPSTICK & We Have the Option to Choose the shade which We like to wear. So I Choose Fuchsia Flash For myself. This Lipstick is extremely luxurious which has an advanced formula that stays intact all day. It suits all skin types and can be used every day as well as/or during parties. With softening and moisturizing benefits, it will leave your lips ultra-soft, making you feel more beautiful! Guys We Have The Option to Choose the shade of Our Choice which we love the most. There are all retro & trendy to Choose from , for The Filmy We .. I Choose A Bold Red Lip Colour For myself. The hue is so flattering , best suited for Fair Skin tones. This Colour is highly Pigmented & gives a major colour off. Below Find The Swatches Of Both The Lip Colours .. Priced at Rs. 465/- Comes in a round tub weighs 50ml . This is a chemical free scrub which will help in removing complete dirt and reduces blemishes on your face. Made with all Premium Ingredients. This Scrub gives a Nourishing glow to the Skin & Polishes Within .. SUITABLE FOR ALL SKIN TYPES.. This kaolin based face polish is enriched with beetroot extract and vitamins to feed your skin. All the goodness your epidermneeds. So, go on scrub it in! Priced At Rs. 195/– Comes In a 200ml Spray Bottle . This Refreshing toner is loaded with the Goodness of Cucumber & Mint .. It Gives a cooling sensation & gives a Nourishing glow to the skin . It’s A Best For Removing Stubborn dirt & acts as a makeup remover also. It’s really Important to remove all the make from the facial skin before heading to bed because our skin Can ages 7 times faster if we leave any day cream or makeup without removing them & sleep. N What’s Funny Part about this box is That We have to answer the question asked in the Leaflet in Alia’s style !! Please refer the image below Carefully .. These are all Reviews of The Products which I received inside the November Glamego box. Today I’m Sharing My Thoughts with you all, is to ” why To choose Subscription Beauty boxes ” ??. Why To Choose Subscription Beauty Box ?? Subscription is the best way to choose between brands and products without burning the pocket and time.Outside India more than 80% of women opt subscription boxes to explore beauty.And in India too it is adopted well and women are choosing smart way ofdiscovering brands. Rather than buying a full size facewash and keeping it aside as it does not suits you isof total waste of money and time.Best way of exploring and discovering about the brands, products and ingredients isopting for subscription box. Guys Do Check Their Page For Complete Awesomeness to be delivered at your doorstep each month for Just Rs. 299/-. Find The Detailed Description Of How This Subscription Works & Price Of Each . There Are Four Subscription Plan To choose from, according to your needs & Requirements. The Higher You choose the number of Months , Higher Discount You will get. Do Visit The Site Like Now ??? & Yes Do Thank me Later. ?? I Hope You All Find My Review Helpful. As Sharing Is Caring ..
N Yes I’m Super Impressed By Their Speedy Delivery ..
Have a Fabulous Weekend Ahead !! Thanks for reading Hun. The box is amazing. Do check. Cool packaging, super affordable box ?? 2 lipsticks, baaki products bhi great ?? aur kya chaiye ? ?